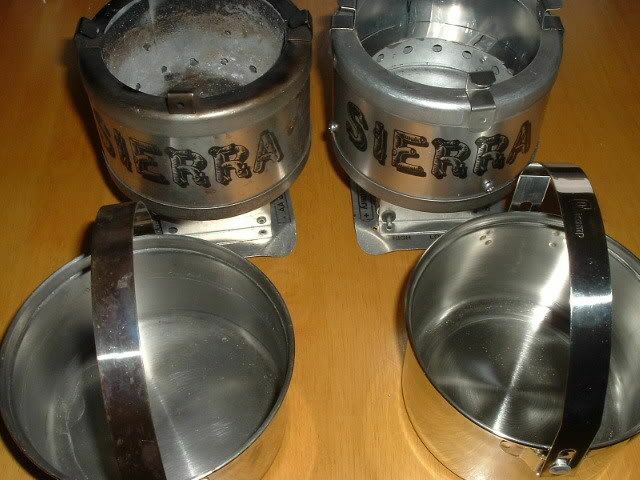 The double wall feature onbackpacking size stoves is worthless to the performance of the stove. I've modified my zip stove to eliminate the double wall feature. 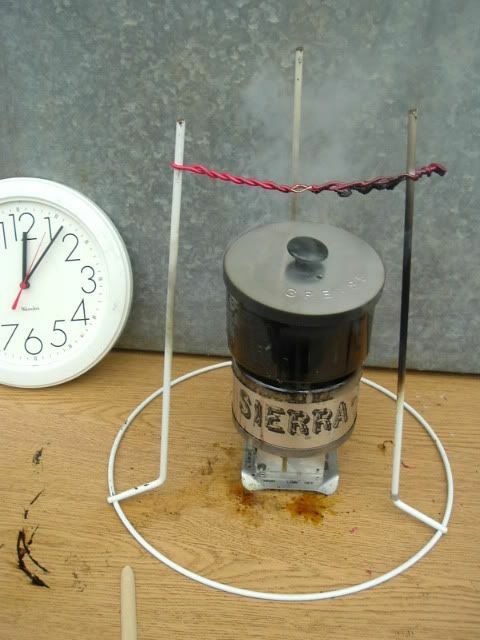 I believe the heating of the fan forced air to be insignificant in the performance of the stove. 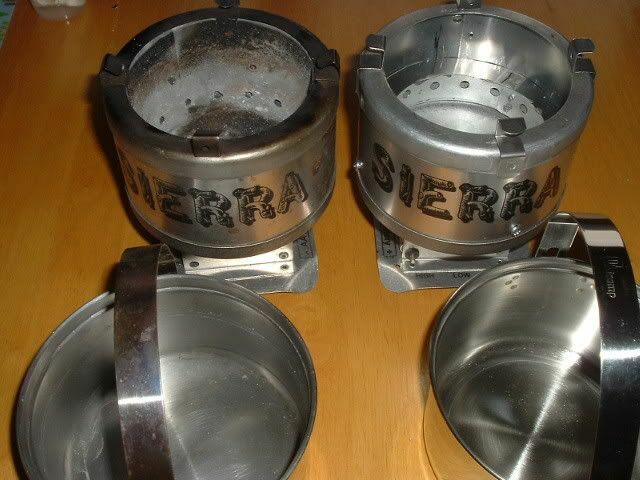 The volume of forced air being the major contributing factor for the stoves ability to consume wood and provide high heat at a very fast rate. 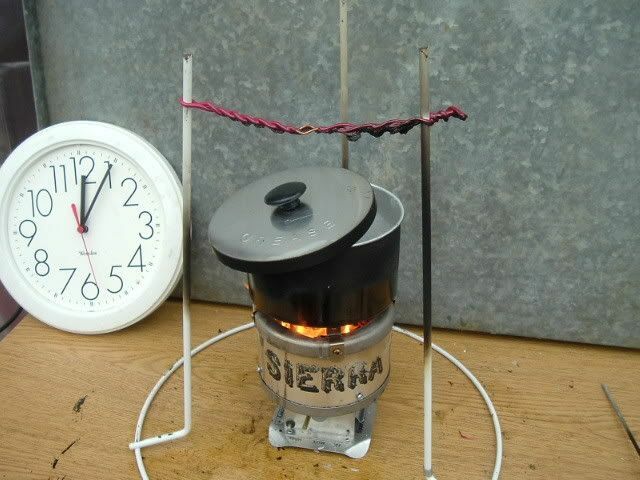 I will perform tests using my old stove side by side with the modified version as time and weather permits. 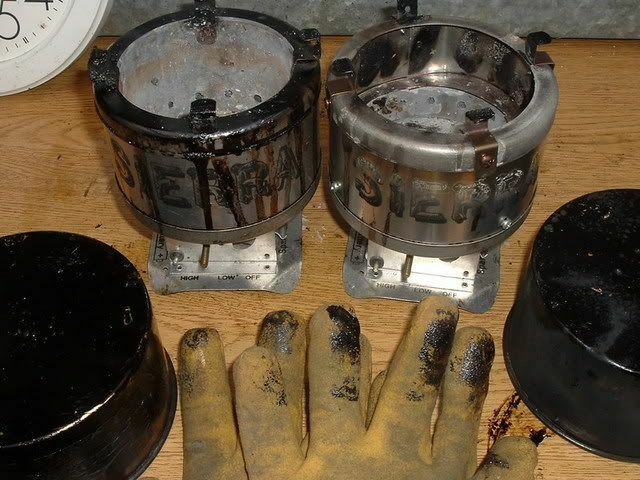 Fourth photo shows stove in a bare bones state without upper rim attached. 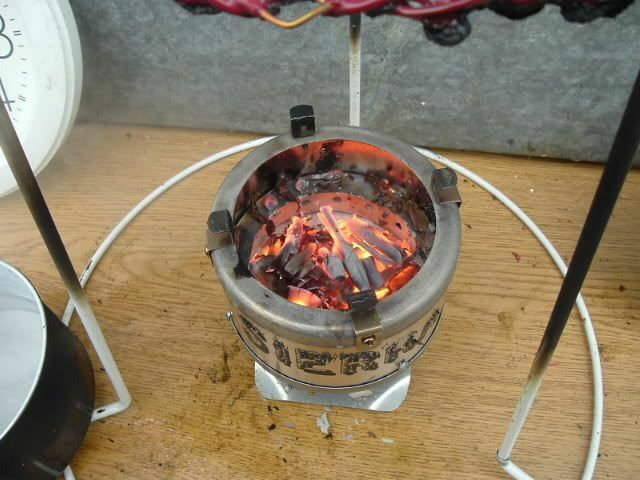 Stove has sufficient strength to be used without it in my opinion. Reduces weight by 18 grams/0.58 oz. 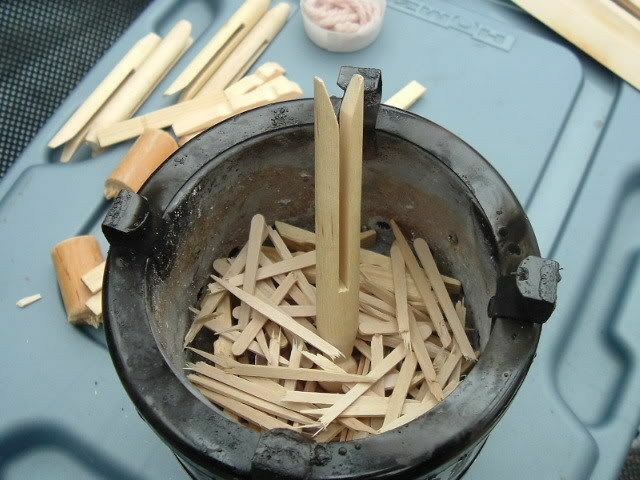 Fifth photo shows cutting being made with a Dremel rotory cutting tool. Blade being used is a diamond impregnated cutoff disc. 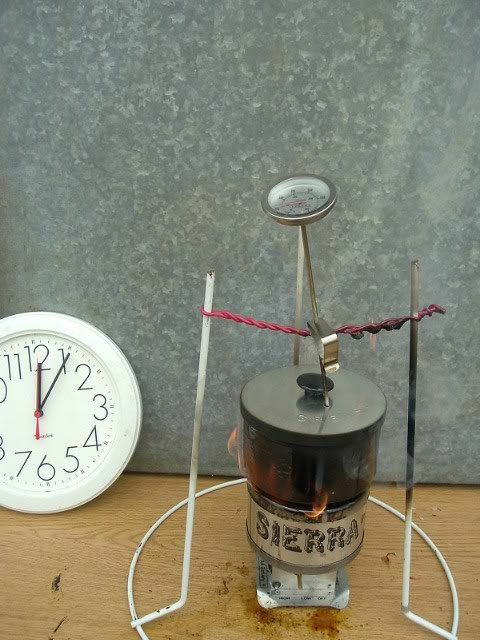 The stoves weight before modification was 326.2 grams/10.49 oz. 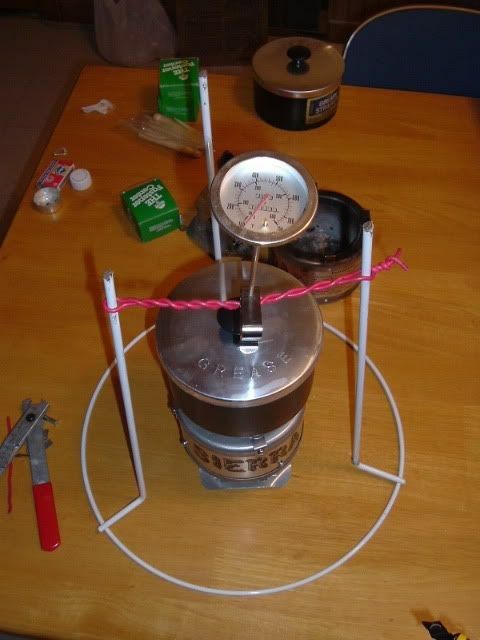 Modified stove(with rim) weighs 203.7 grams/6.55 oz. Total weight reduction is 122.5 grams/3.94 oz. 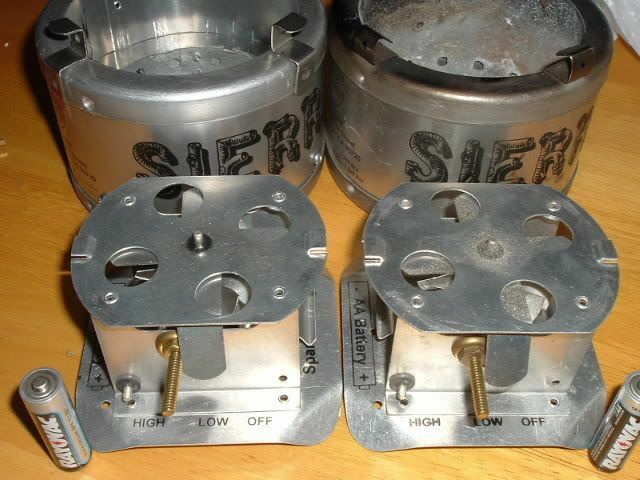 The stove weights given are without fan assembly. Fan assembly with battery weighs 110.5 grams/3.55 oz. 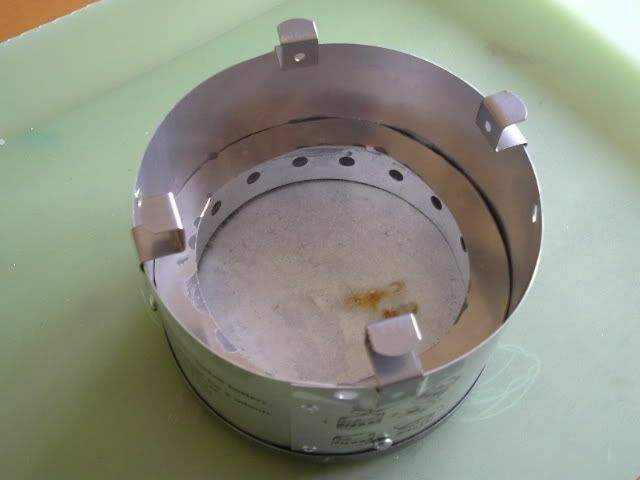 I've completely photographed the modification procedure and will post photos and instructions after burn tests are completed. .007 stainless steel was used to cap off the shortend inner walls to maintain the flow of forced air through the row of holes located on the lower innermost wall as seen in one of the photos. 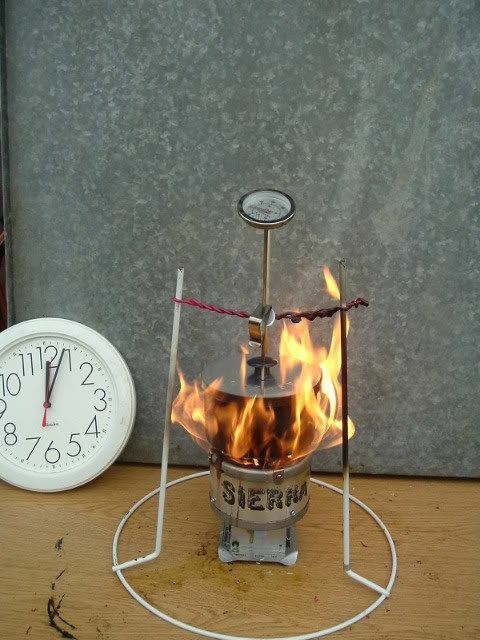 Enough people wanted titanium zip stoves so they made them using TI. If enough people want a single walled stove they'll make them that way, don't you think so? Less walls, less weight. 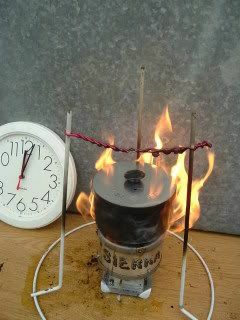 I chose this type of Softerware so that each test burn can have the the same amount of fuel for each consecutive burn. 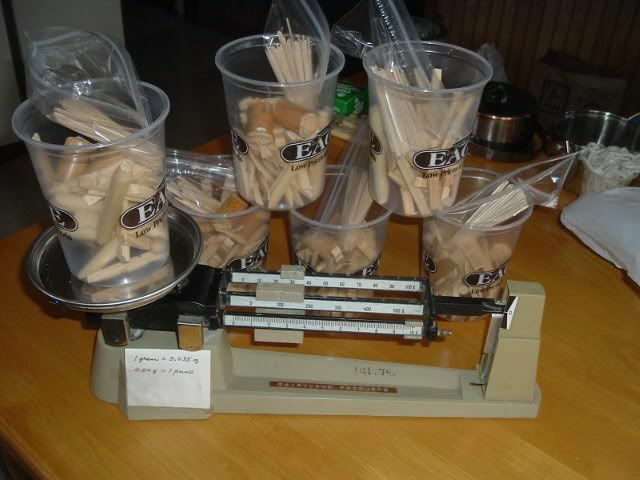 I will count out the exact amount of each size fuel piece for each test. I'm using fluffed cotton yarn for my tinder starter and the different size sticks as shown in the second photo. Yep!!!!! 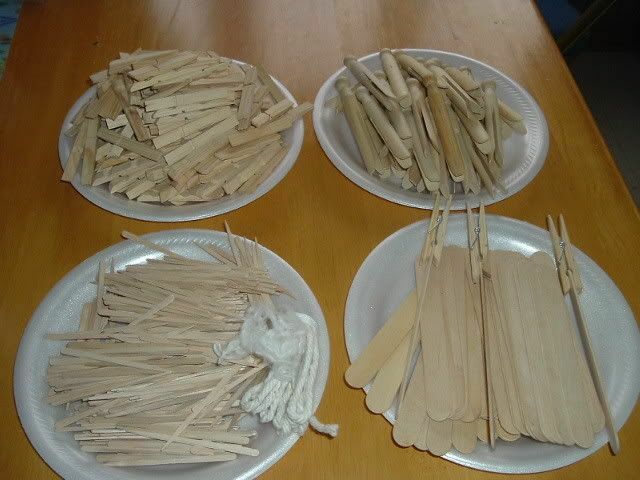 Clothespins all nice and kiln dried, tounge depressors, and craft sticks. Are all of you in agreement that this is looking to be a fair way to go about testing my theory???? 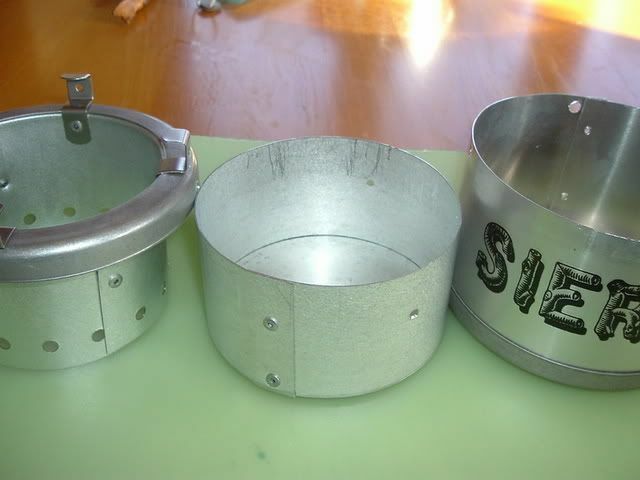 I found that the ss pots were not the same weight, one was 38 grams heavier, I swithced to using Kmart grease pots with outward rolled lip. Both were identical. 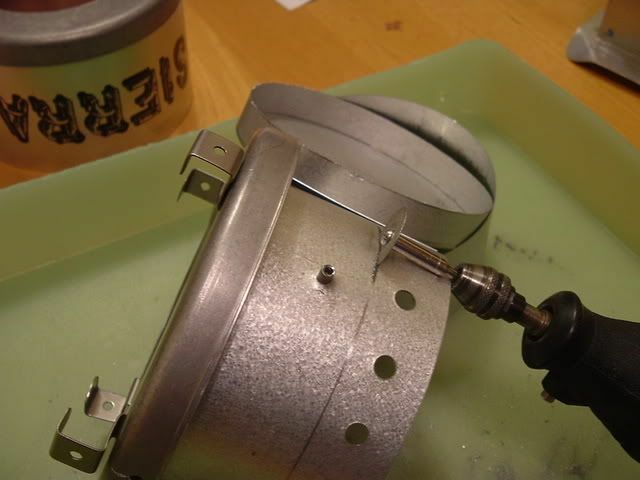 I attached machine screws to the body of the fan housing to create a stop for the lever that controls the volume of air going into the stove so that each test burn the air volume will be the same. 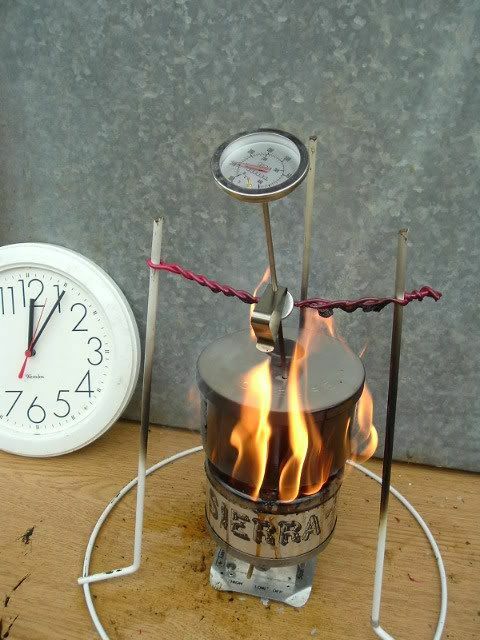 Assembled a thermometer stand to hold thermometer in pot while stove is heating. Long stemmed thermometer to keep my face away from hot stove and be able to monitor constantly. All materials are now in unheated greenhouse to be aclimated overnight in preparation for tomorrows tests. 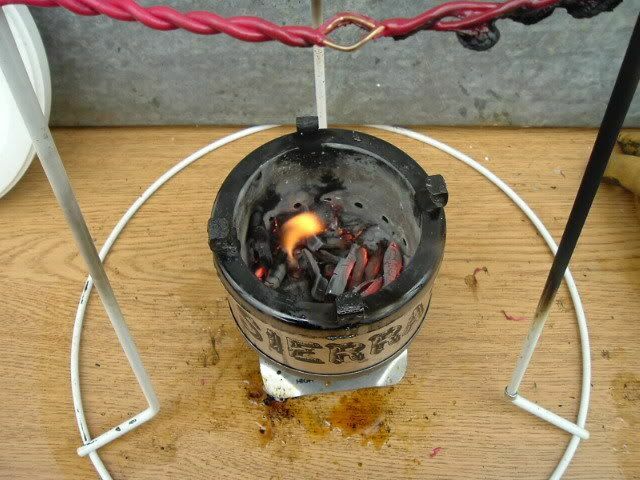 Three tests per stove will be made. Any Comments? Anything I forgot? 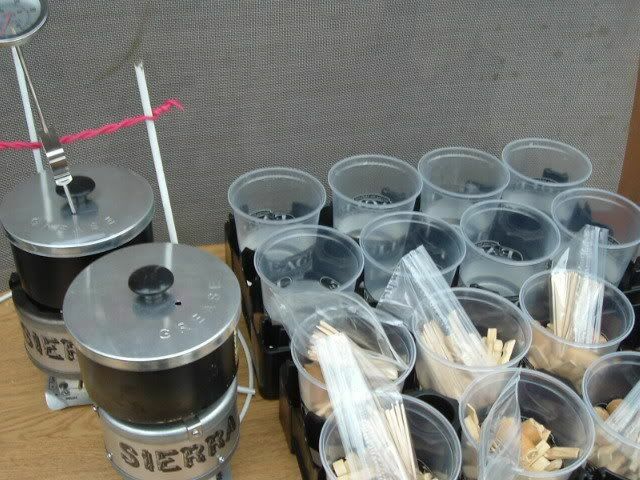 Three tests for each stove have been completed. 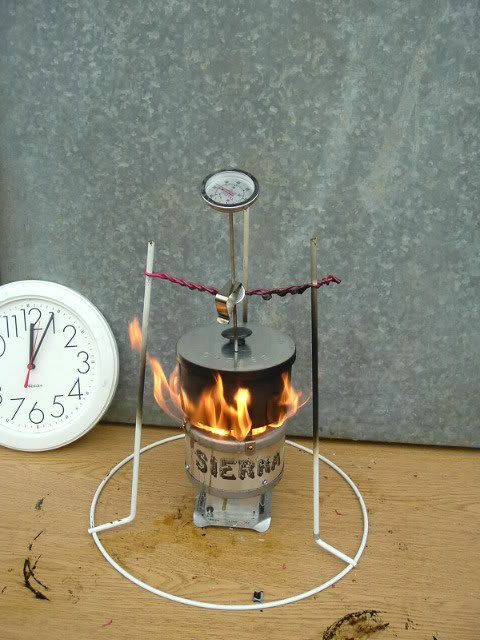 After lighting, each stove was given one min. 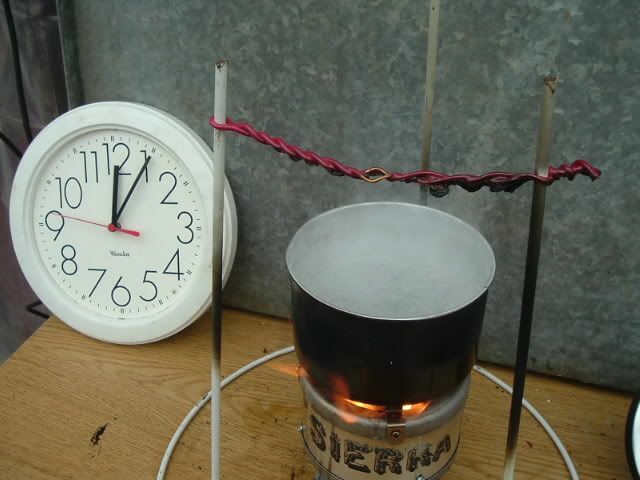 of time for tinder to ignite fuel and then pot of water containing two cups of water was placed onto stove. 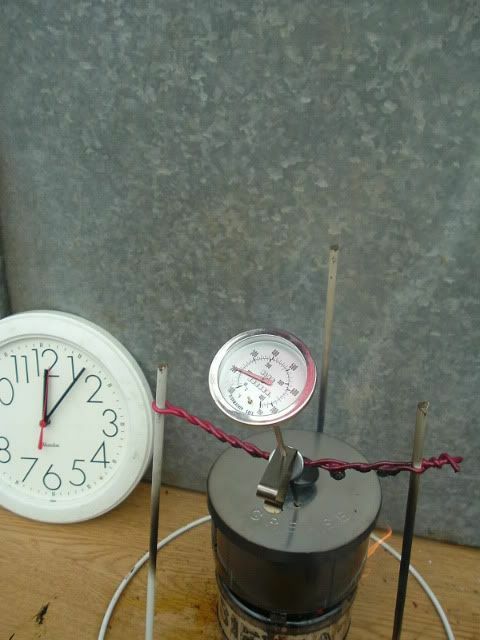 A clock was placed in a position to the rear and off to the side for photos to show min. into burn. 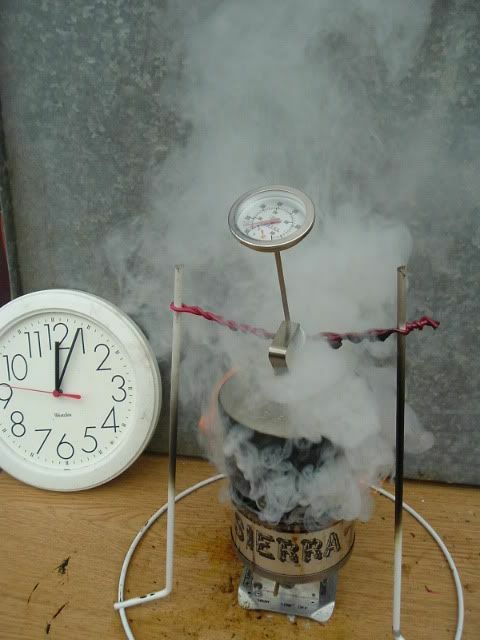 Temperature of water, fuel and air was at 35 degrees for the first two sets of tests. 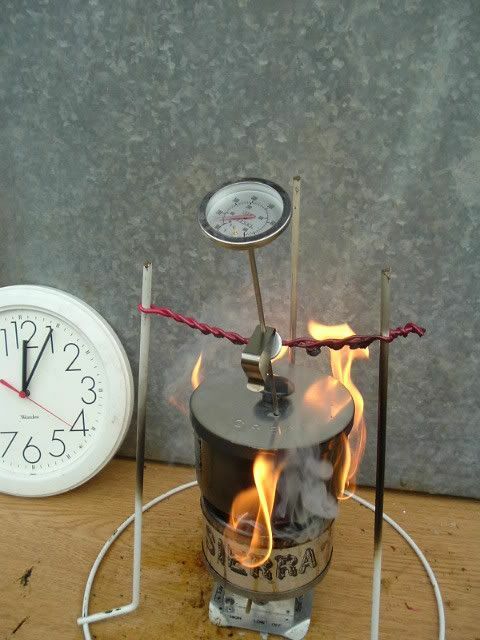 The temperature for the third set of tests had risen to 37 degrees. 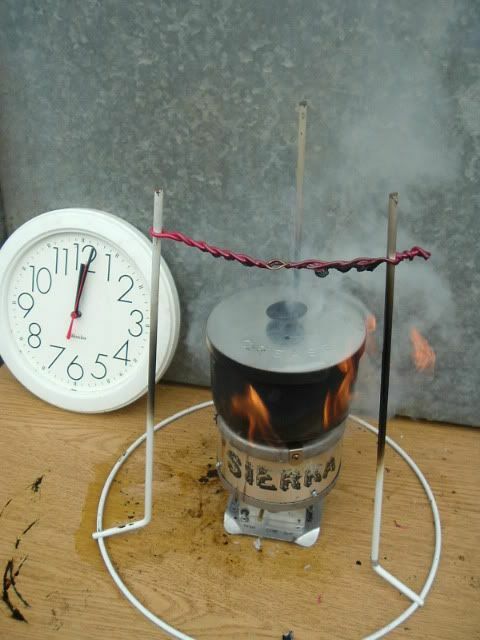 The next six photos show the progression of testing the unmodified stove during the second set of tests. 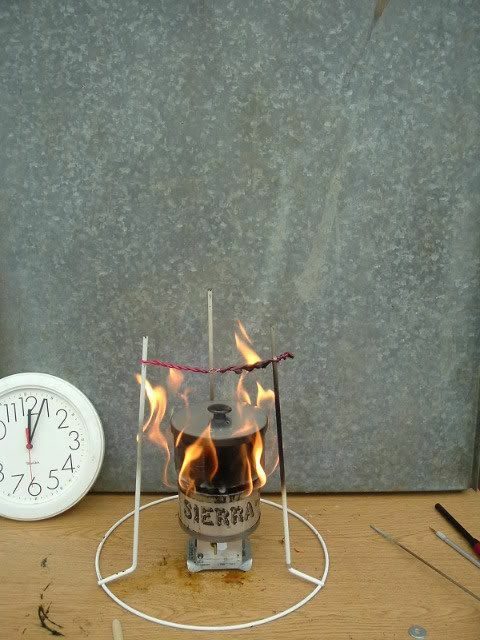 The next seven photos show the progression of the testing of the modified stove during the second set of tests. 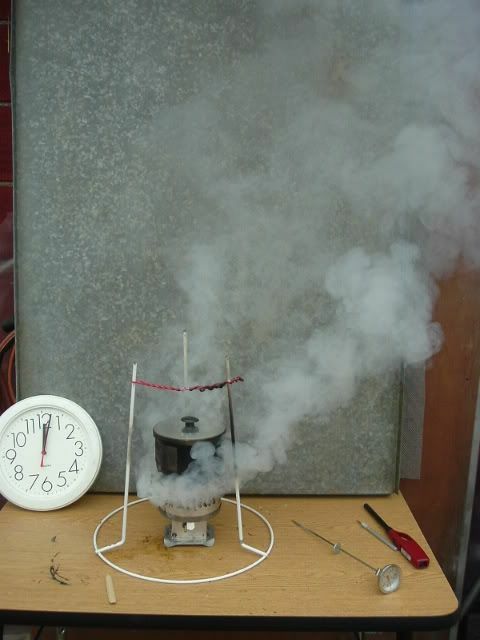 The next eight photos show the progression of the third test done on the unmodified stove. 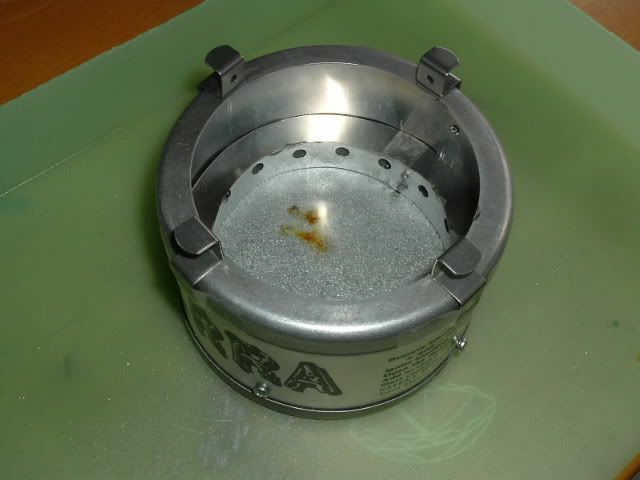 Also shows how the fuel was packed into the burn chamber. 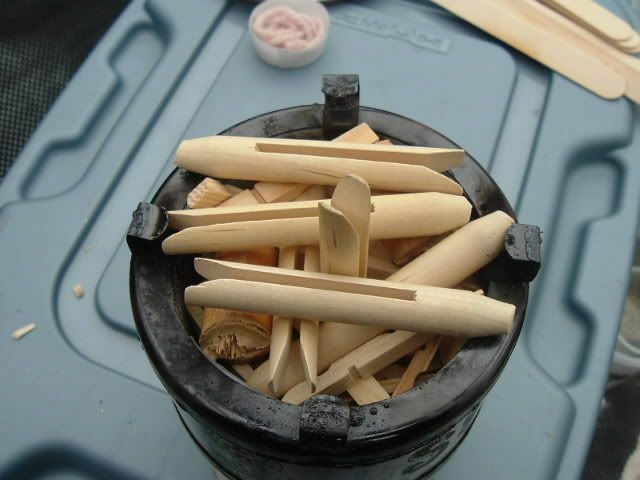 The fuel was stacked around a clothespin in the center and later removed before lighting the tinder located at the base of the clothespin. 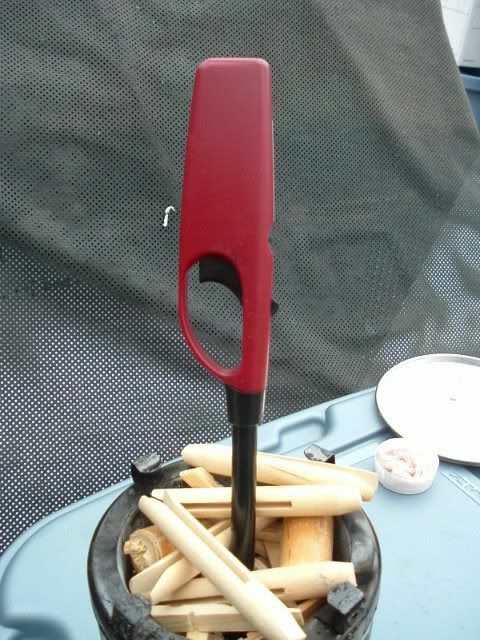 The clothespin formed a hole that was used to put the butane lighter into to start the tinder as shown in one of the photos. Photo seven: 5 min. into burn, temp. at 200 deg. 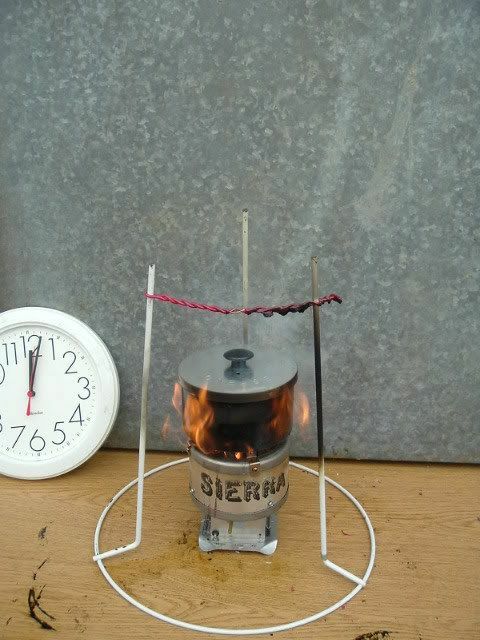 The next three photos show the progression of the third test done on the modified stove. Water boiled at 4 1/2 min. 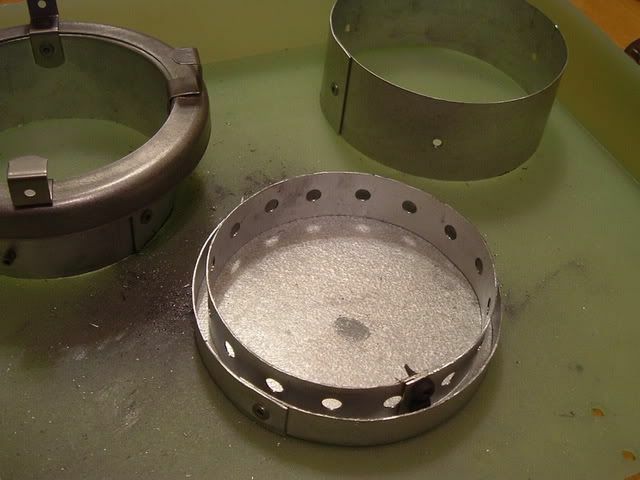 The next two photos show cleanliness of stoves before and after test. 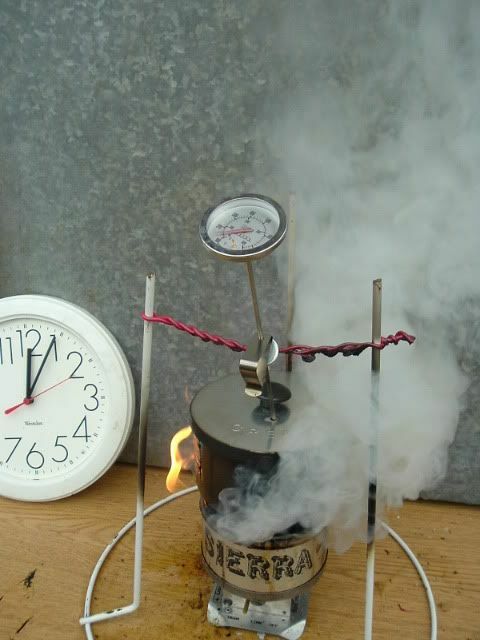 Unmodified: Test one: 5 1/2 min. 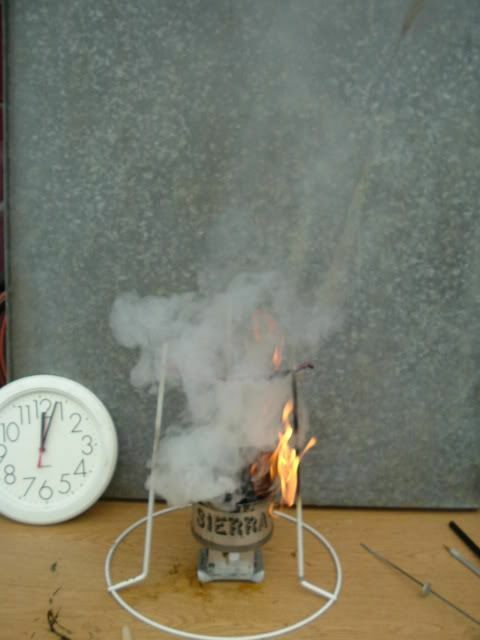 Modified: Test one:4 1/2 min. Test three: 4 1/2 min. 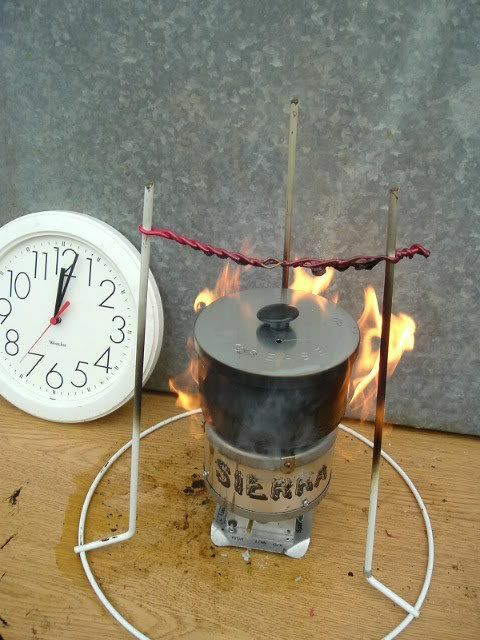 The Results: The Modified stove outperformed the Unmodified. I thought their double wall design is supposed to make the fire burn hotter and reduce the wood completely to ash? No? 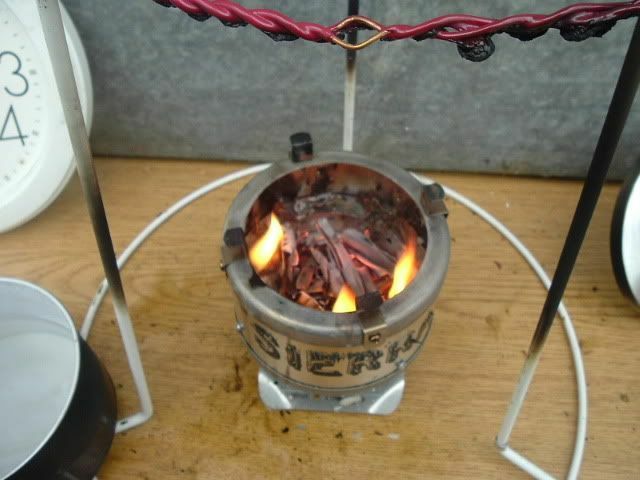 Does chafing fuel clean the soot and creasote from the wood fire?